Everybody is talking about Kevin. It’s been the toast of film festivals, from Cannes in the summer, to the recent London film festival, and Glaswegian director Lynne Ramsay brought the discussion to Glasgow last week for the Scottish Premiere at the Glasgow Film Theatre, which was also attended by Kevin himself, Ezra Miller, and co-screenwriter Rory Kinnear. We Need To Talk About Kevin is no easy watch, but it was never going to be. Adapted from the 2003 novel by Lionel Shriver, the film tells the story of a guilt-stricken mother (searingly played by Tilda Swinton) trying to reconstruct her life after her son, Kevin (played by a chilling Ezra Miller), commits mass murder with a crossbow at his high school. The film is seeping with turmoil and tension; told two years after the massacre, we witness the isolation and hatred Eva experiences daily. The audience share her anguish, as the film flashes back to Kevin’s difficult childhood and her own post-natal depression, and we witness the simmering malice of Kevin, before it boils over in horrifying fashion. The film ignites the classic ‘nature versus nurture’ debate, and forces the audience to consider themselves in Eva’s situation, making it a film that’s guaranteed to haunt you for days. When asked about her own stance on the nature/nurture argument at a Q&A following the premiere, Ramsay said, ‘I think a child picks up on the feelings and emotions of their mother from a very early age, and it can really affect them’, whilst Miller took a more agnostic stance, saying ‘I don’t see where one ends and the other begins’. That’s easy for him to say- as the sadistic Kevin, Miller delivers a terrifying performance. His hapless father (John C. Reilly) is oblivious to Miller’s manipulative ways, and only Eva can see that the ‘accidents’ that occur in their home, such as her daughter Celia’s guinea pig ending up in the waste disposal, are calculated by Kevin. It’s a performance that makes the audience uneasy, so what’s it like to play such a character, then wrap up at the end of the day and go home, I wondered? ‘It was a little harrowing, for sure, but fortunately I have a very kind mother’, explains Miller, ‘I refused to speak to her, or anyone really, while I was making this movie. After we finished shooting I just ran to her comfort and travelled a lot- it’s good to wake up from a nightmare!’ Ramsay too described the on-set feeling as ‘intense’. The transition from the page to the screen was a difficult one. The book gained a lot of notoriety upon release due to the subject matter, and became a bestseller, winning multiple awards. It had also been deemed ‘unfilmable’ due to its epistolary narrative, and fans of the film feared the dreaded voiceover; however Kinnear said that there was ‘no way we’d ever have a voiceover- it’s just not cinematic’. That of course left the challenge of transferring a story composed of letters into a script. Ramsay also said that the story was ‘like a jigsaw…I’d never made anything non-linear, so that was a challenge’. The next thing to do was find Kevin, a character so many fans of the book had grown to despise, fear, or sympathise with, depending on their take on the novel; ‘when he walked in, he was Kevin’, Ramsay says of Miller, ‘but it was terrifying how many people identified with Kevin and wanted to play him’. Lionel Shriver, the novel’s author, approved of the casting- ‘she has problems separating Ezra from Kevin’, said Ramsay. It’s a bold and fearless film that forces itself into the consciousness of the audience. Tension builds throughout, from the muted dialogue and enhanced sound, to the continued use of red, which begins with tomatoes, jam, and paint- the audience predict that soon blood will take their place, it’s just a question of when. It’s techniques like this that ensure the audience doesn’t forget the film upon leaving the cinema; ‘when we were writing the script, Lynne was very concerned by We Need To Talk About Kevin being the title’, explains Kinnear, ‘because we had taken out the letter used in the novel, no one was talking about Kevin. But the purpose of the film is for everybody else to talk about Kevin, and consider their own opinions on nature versus nurture’. 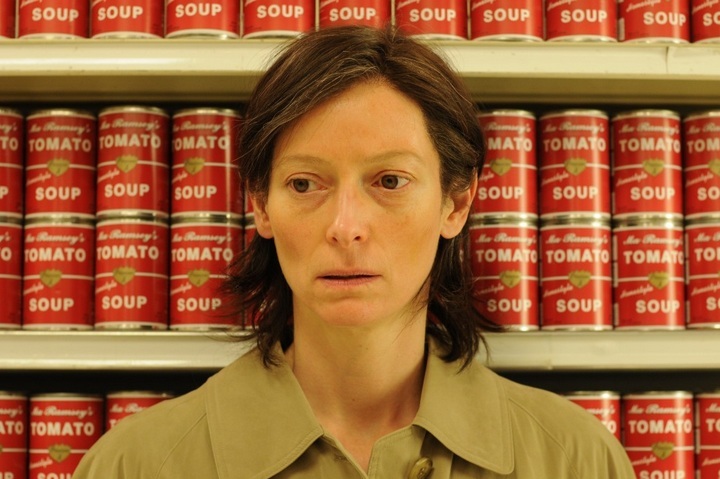 Posted in Arts and tagged ezra miller, film, premiere, tilda swinton, we need to talk about kevin. Bookmark the permalink.